p>About Birtley Town Sports Complex A modest ground sitting in the countryside just outside Newcastle. Three sides of the ground are tree-lined with the south end backing onto an old factory. The main East Coast railway line passes above the ground to the west. The ground has a small seated stand and a covered terrace on the west side, with a club house to the south. A bar is housed in the metal container on the east side of the ground. How to get to Birtley Town Sports Complex If you are heading from the South on the A1 you should ignore the first sign for Birtley and Chester-le-Street (just before Washington Services) and head past the services. Stay on your left as if you are going to Newcastle. The Angel of the North will loom large on your right hand side – it stands beside the roundabout that you want to come off at. Take the first left with the sign to Birtley and you will be on Durham Road. About 1 mile down the road you will pass The Golden Lion pub on your right and then the William IV pub on your left which is opposite a huge Komatsu building (huge sign outside). Just past the Komatsu building is a disused petrol station on your right (on the left will be a motor caravan forecourt), turn right immediately in-front of the petrol station and go down the small road into the ground. Car park is on the left when you enter. The nearest station is Chester-Le-Street and a taxi will be required to get to the ground. 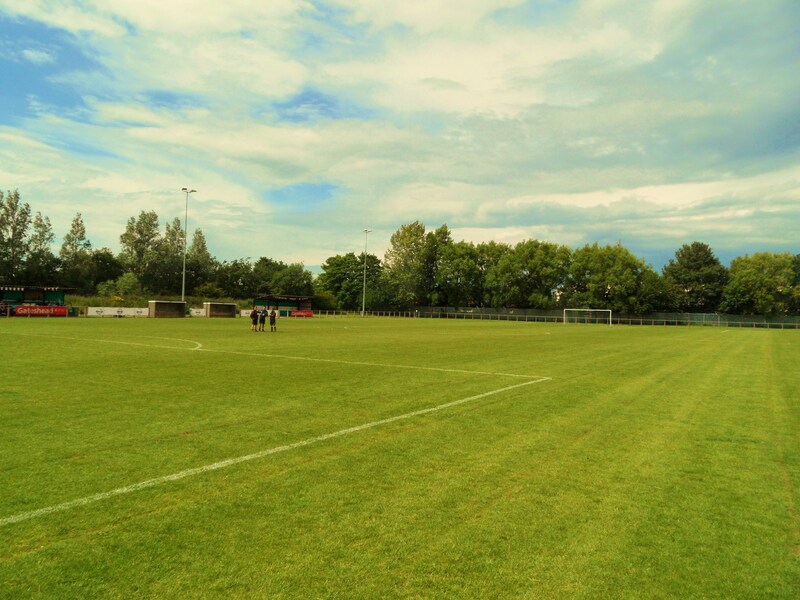 Admission to Birtley Town Sports Complex Admission is £5 for Adults and £1 for concessions. “Never go back” they say. Who exactly are they? Well let me tell you they are wise people. Age creeps us on us all and for all you young scamps out there scoffing at us “oldies” just remember in football the good do not die young. In fact Edwin Van Der Sar is only marginally younger than me and he has just won his millionth league title with Manchester United. So there is nothing wrong with us putting our bodies on the line as our age. Two years ago I was tempted out of retirement. I was seduced by the glamour. Young (himself having seen his 40th year last year) Adam Lloyd won an auction prize to play football against the Chelsea Veterans team down at the Cobham training ground. Would I like to play? Too bloody right I would. So who cares we lost 8-0 in the end. Who cares that 53 year old Clive Walker bossed the game and who cares that John Terry himself came to watch for all of ten minutes. Well I bloody did that is for sure. I had to put up with the whingeing and whining of Richard Keys for ninety minutes. Yes I fouled him, yes I pulled him back by his (excessive) arm hair, and yes I did give him a little nudge as he chased a ball out of play. But I did my job – I stopped him scoring, even if it meant I put the ball through my own net rather than him scoring from a tap in. (more details can be found here). I rolled into bed that night vowing never to pull my Puma Kings on again. However, like all the greats – Ali, Tyson, Best, Ronnie Jepson, Take That and Victoria Principal in Dallas, I agreed to come back for one more gig. It had to be big and it had to be special. Once you have nutmeged Colin Pates there is only so far you can go. The call came out of the blue and normally I would have said no, but three factors swayed my conscience. 1. It was for charity; 2. It was being played at a ground I had never been to nor was I likely to ever go to again; 3. We were going to Glitterball afterwards; Truth be told they could have just offered me a night out at Glitterball, South Shields “premier party venue” (as if there are many others) and I would have said yes. This is the place that created the word “Cougar”. So Saturday morning dawned and I was heading a long long way up north. A quick stop at the in-laws to drop the Little Fullers off and I was heading to the Angel of the North who would point me in the direction of Birtley, and more specifically Northern League Division Two side Birtley Town. Here I would be making my long-anticipated return to the game. This was no ordinary match. This was in aid of the Cobaltore Onagawa team from Japan whose facilities were devastated in the Tsunami last year. The chaps behind this game, Grassroots International can explain it ten times better than me here. The banter amongst the Football Writers team had been raging for weeks. Who was starting, who wanted the number 7 shirt and then who was going to be wearing the most ridiculous boots. That last one certainly wasn’t me. I was going to be wearing my new Nike Tiempo Premier boots, kindly provided to me by Sports Direct. These were proper footballers boots. Soft black leather, one of those tongues that you can pull down over the laces for that extra special volley and of course molded studs for the hard July pitch. The boots summed up my style of play. Professional, no-nonsense but a hint of mercurial magic. I was sure to be the only play on the park with such traditional footwear. So who was lining up for the Football Writers alongside me? Over there is Andy “Huddo” Hudson from Gannin’ Away. Next to him is “our kid” aka his brother for us southerners, Michael Hudson from the Accidental Groundhoppers blog. Our old mate Andrew Gibney, Yorkshire’s best known Scottish expert on French Football, last seen hiding beneath the tarpaulin at Wakefield FC along with In Bed With Maradona’s David Hartrick and Jeff Livingstone who was to be our wise coach for the afternoon. And who is that coming over the hill? Is it a monster? No it is Iain Macintosh and Simon Bird, skipping gayly around the pitch in some sort of bizarre warm up exercise. Just to prove it wasn’t all about the “oldies”, we also had the outstanding talent of Tomasz Mortimer in goal, the UK’s finest and foremost expert on Hungarian football, Ian Rand, a man who isn’t bitter at all over Carlos Tevez. Scotland had sent their best man, but he got lost in the Bigg Market so Scott Johnston stepped in instead. Our midfield was also boosted with the Swedish magic of Blackburn Rovers own Pras Murukesvan and Ryan Hubbard, the thinking woman’s Justin Bieber. Throw us lot together and it would normally be chaos. But we had a secret weapon in the form of Gavin Fell. Gavin, currently assistant manager at Blue Square Bet North Blyth Spartans had won the FA Vase with Whitley Bay so knew his onions. Unfortunately he made that age old mistake of assuming that tide and time wait for no man, and so despite not putting in 90 minutes in over two years I was put straight into the starting XI. A ten minute warm up did me in, leaving me gasping for air. I wasn’t alone. Hartch and Macca were also puffing after the second set of groin stretches, and I pretended to do the next two. After all, I’ve never had a weak groin, fnar fnar. Our opponents, The Northern League Fans looked impressive in the warm up. Our at least two of their number did. I asked Andy about them and was told they were Paul Robinson and Paul Chow. “Of course” I said, as if I was expected to know who they were. Northern Writers United 4 Northern League Fans 6 – Birtley Road – Saturday 10th July 2011 “Whitley Bay centre forward. Three times FA Vase winner. The stuff of Stuart Fuller’s nightmares.” So I should have bothered to read the programme prior to the game then. That was the description of Paul Chow. For the first five minutes I had him in my pocket. I even nicked a ball off his toes. This was easy. And then I overstretched for a ball and heard a “pop”, and pain shot up my groin. Worse still, Chow was clean through and fortunately managed to slip to give me enough time to hop back on the line, but he took it too wide anyway. I was determined not to be the first man off. Fortunately Iain Macintosh had that honour but I was not far behind him, by which time NLF were one nil up. I did what any good Sunday League player would do in the circumstance – I went behind the dugout and threw up. Just as I composed myself Andrew Gibney stuck a microphone in my face. That will be one hell of an interview. The rest of the half ebbed and flowed. Ryan Hubbard scored a fantastic goal, reminiscent of Kenny Dalglish for Liverpool v Club Brugge in the 1978 European Cup final at Wembley. However, Chow and Robinson were the difference in the first half, so much so that in a bizarre deal that saw the Northern League Fans get a free ticket to a Blyth Spartans game this season in return for Chow and Robinson to swap sides the scores were evened up as we entered the final ten minutes. As the NLF took the lead with just six minutes left I put on my best brave face and jogged back on. Actually, it wasn’t a substitution as nobody appeared to come off but hey, football was the winner in the end. With barely a minute to go we got a corner. Tomasz Mortimer was urged forward from his goal and found himself unmarked as the ball sailed over the defenders on the line. It was Jimmy Glass and Gordon Smith rolled into one. And he headed it wide. Sixty seconds later it was 6-4 and game over. We didn’t blame Tomasz at all…well, not after an hour after the game. Handshakes all round, showers and then beers. A magic metal container door swung open and inside was a fine display off Geordie magic. I ordered up a Newcastle Brown Ale, trying to look at home. But these are cosmopolitan times in Tyneside and I was the odd one out amongst the Kopparberg Pear Cider over ice drinkers. What next chaps – little umbrellas in their drink. And Cornish Pies? Please Jeff. You may be the editor of one of the finest football websites in the world but you need to realise that a Cornish Man’s pride is in his pasty, not a pie. We watched the second half of the Birtley Town versus Ryton & Crawcrook Albion game, made more entertaining by an excellent, and very impressive (in all ways) female referee Linzi Robinson who kept the game flowing without any fuss. After the final whistle with the home team sneaking a 2-1 win it was time to head off to the bright lights and the big city. Newcastle hadn’t changed. Lots of groups of Stag and Hen parties. Quite why they need to dress up and draw more attention to their ridiculous behaviour I will never know. We leisurely moved from bar to bar, avoiding the hideous sites. I have to say that by this point the groin was stiff, and not in the way that I would have liked in the situation. Talk came around to Glitterball out in South Shields. Talk of daughters, mothers and grandmothers all vying for the same man’s attentions and that was enough to have me failing a late fitness test. Glitterball would have to wait. Instead I had a night on the floor of Hartch’s hotel room to look forward to, and all the Jaffa Cakes I could eat. Who said the life of a Non League pretend footballer was all glamour. Hats off to the Hudson brothers for arranging such a fantastic day even if the chance of ever having a third Little Fuller has gone forever. For a much better report on the game head on over to Roker Report. More photos from the fantastic day can be found here.